Born in Earlsferry in 1875, Andrew Herd Scott caddied in Elie as a boy. He was a nephew of the great clubmaker, George Forrester, with whom he served his apprenticeship and worked under Charles Hunter at Prestwick also before opening his own business in Elie. He was a fine player too and Harry Vardon came to Elie to play against, 'A H Scott, of Earlsferry, one of the young school of professionals who now and again astonishes the world by his dexterous use of the golf club' in 1899. The world was not astonished on this occasion, a crowd of around 3000 watched Vardon win 10 and 9 in the two round match. Best known for his Straightline putter of 1899 and his patented (number 21,403) 'Fork Splice' unbreakable neck wood of 1895. He received a royal warrant from King George V, first as Prince of Wales in 1905 and then as King in 1910, and so incorporated the crown within his cleek mark. At least three variations of this are known, a four-pointed star supporting a crown with a lion on top, the crown and lion only, and the lion alone. 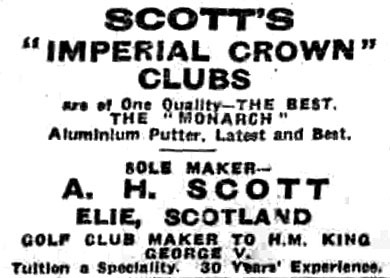 On the strength of his royal appointment, he announced the opening of a new shop in Burntisland in the Edinburgh Evening News of 21 April 1905 offering ‘a fine selection of golf clubs and all kinds of rubber-cored balls’ with ‘repairs executed by an expert clubmaker’.